of Wallace and other Rebels. Wallace enters his fifth season as a Runnin' Rebel in 2011-12 ... Suffered a torn ACL in his right knee at the end of August 2010 and missed the 2010-11 season (redshirt year) ... Has played in 94 career games, making 10 starts ... Has scored in double figures 11 times in his career ... A career 37.1-percent shooter from 3-point range and 73.7 percent from the free-throw line ... Has averaged 4.8 points and 1.4 rebounds in his career. Used the 2010-11 season as a redshirt year after tearing his ACL prior to the season. 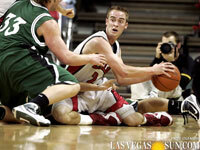 Played in all of UNLV's 34 games, making nine starts ... Averaged a career-high 6.9 points per game ... Shot 42.1 percent from the floor, 39.9 percent from 3-point range and 76.5 percent from the free-throw line ... Of his 80 field goals made, 61 were from behind the arc ... Was fifth in the Mountain West in 3-point shooting percentage and tied for 10th in 3-point field goals made ... Led the Runnin' Rebels in 3-pointers made ... Scored in double figures in seven games and led the team in scoring twice ... Came off the bench in a win at New Mexico to score a career-high 21 points on 7-of-10 3-point shooting ... Had four other games where he made four 3-pointers and an additional game with five 3-pointers made. Played in all 32 games, making one start ... Averaged 4.6 points per game ... Finished the season with 37 3-pointers made, which was third on the team, and shot 41.1 percent from behind the arc ... Shot 39.8 percent from the field and 76.2 percent from the free-throw line ... Reached double figures for the first time in his career against Northern Arizona, scoring 14 points on 5-for-9 shooting, which included a 4-for-6 effort from 3-point range ... Scored a then-career-high 15 points against Southern Utah, going 5-for-7 from the field with three 3-pointers ... Came off the bench and scored 12 points on the road at TCU, going a perfect 4-for-4 from downtown ... Put together his best performance up to that point in a Runnin' Rebel uniform on the road at Air Force, sparking his team by scoring 15 points on 5-of-9 3-point shooting in a then-career-high 27 minutes of playing time ... Made his first career start at home against TCU. Played in 28 games, all off the bench ... Missed the first seven games of the season because of a stress fracture in his foot ... Averaged 2.4 points per game ... Made his Runnin' Rebel debut at Northern Arizona, scoring a season-high nine points, including hitting a pair of 3-pointers and going 3-for-3 at the free-throw line (his first points as a Runnin' Rebel were on a four-point play). A 2007 graduate of Mountain View High School in Mesa, Ariz. ... Broke the school's career records in scoring (1,392 points), assists (447) and steals (202) ... As a sophomore, averaged 10 points, three assists and two steals per game ... Scored 18 points in the Toros' 2005 state championship victory ... That team went 32-1 ... As a junior, he led the 2006 5A championship team with 17.9 ppg, 4.1 apg, 2.6 spg and in 3-point shooting ... Earned first team all-state honors as a junior leading his team to a 29-3 record ... As a senior, he averaged 17 ppg, six apg and four spg while again earning first team all-state honors ... His team won its third consecutive state title to become the first 5A team to accomplish the three-peat since 1961 ... That team was 28-4 and ranked 14th in the country by Max Preps ... Coached by Gary Ernst. Kendall Ketchum Wallace was born Jan. 11, 1988, in Bloomington, Ill. ... Majoring in interdisciplinary studies ... The son of Barbara and Jeffery Wallace ... has a sister, Rachel (20), and a brother, Mitchell (18) ... His mother and father both played basketball at John Brown ... His uncle David Barham played football at Alabama, his uncle Andrew Barham played golf at Louisiana Tech and his cousin, Rufus Alexander, played football at Oklahoma and then in the NFL with the Vikings, Colts and Lions ... His Great Uncle Riley Wallace was the men's basketball head coach at Hawaii for more than 20 years and his grandfather Loren is one of the winningest high school coaches in Illinois history ... His father coached high school basketball in Illinois for 17 years before moving to Arizona.